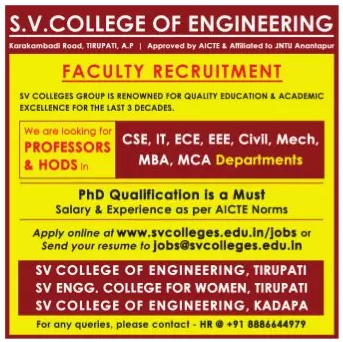 S.V.College of Engineering, Tirupati has advertised in the SAKSHI newspaper for the recruitment of Teaching Faculty- Professor / HOD jobs vacancies. Interested and eligible job aspirants are requested to apply immediately from 22nd January 2019. Check out further more details below. About College: DPC Polytechnic College was established by the D.P.C Trust in 1998. It is a Co – Educational Institution Imparting Quality Education. The College has been rendering a yeoman service in the field if Technical Education for more than 15 years located 6 km from Salem. How to Apply: Interested and eligible candidates are requested to send application along with CV, copies of certificates and recent passport size photos to the email address or apply online at the official web link provided below.